The Restructured Extended Executor (REXX) language is a procedural language that allows you to write programs and algorithms in a clear and structural way. It is an interpreted and compiled language, and you do not have to compile a REXX command list before executing it. With IBM z/OS V1.9, you can harness the versatility of REXX to interface and interact with the power of SDSF. A new function called REXX with SDSF is available that provides access to SDSF functions through the use of the REXX programming language. 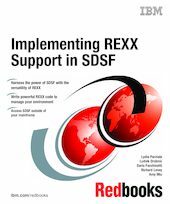 This REXX support provides a simple and powerful alternative to using SDSF batch. This IBM Redbooks publication describes the new support and provides sample REXX execs that exploit the new function and that perform real-world tasks related to operations, systems programming, system administration, and automation. This book complements the SDSF documentation, which is primarily reference information. The audience for this book includes operations support, system programmers, automation support, and anyone with a desire to access SDSF using a REXX interface.